My Scrap Space! – It Works For Bobbi! Published on February 6, 2008 August 9, 2016 by Bobbi-Jo G.
I guess you could call this my big “reveal”! Do you remember when we first moved in here about 2 months ago – I spoke about eventually moving my baby down to share a room with her sister so that we could convert her room into the spare/scrap room? Well, it turned out to be sooner than later! LOL! Like I said, we had the hubby’s friends come for the weekend so we decided that now was as good a time as any. (That was about 2 weeks ago). So, we moved her down and my craft room up! I can’t describe how happy this room makes me now. Just a note, I am not completely finished with it yet – but it’s almost exactly the way I want it. It’s bright, airy, and best of all – it has a door I can SHUT to keep little fingers out. The floor is wood laminate, which makes cleanup a quick sweep, and it’s large enough to have a sofa bed (queen size) on one end and all my craft stuff everywhere else. My workspace is on one end of the room, and I LOVE it! 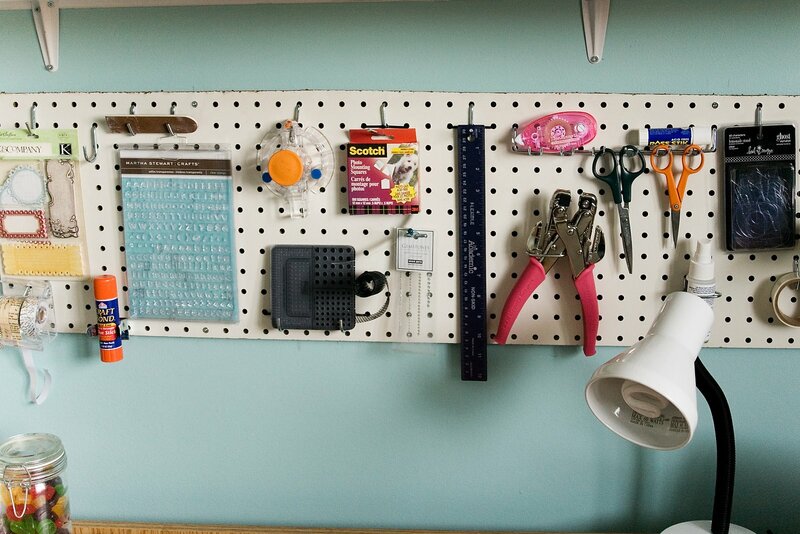 It has all the neccesities right at hand, thanks to the peg board my husband put up for me. This is such a fun way to keep all the tools I use regularily right at my fingertips. On my desk I have more essentials – i.e. candy to snack on as I scrap (it’s low fat, low cal – so it’s okay!) my can-o-pens, and my portable DVD player that gets to entertain me in my craft room while it’s on hiatus from long trips in the van.LOL! On the shelf above my desk I’ve got my jar-o-flowers, my box-o-ribbon, my mailbox-o-photos (which I updated the color on), and my blocks. 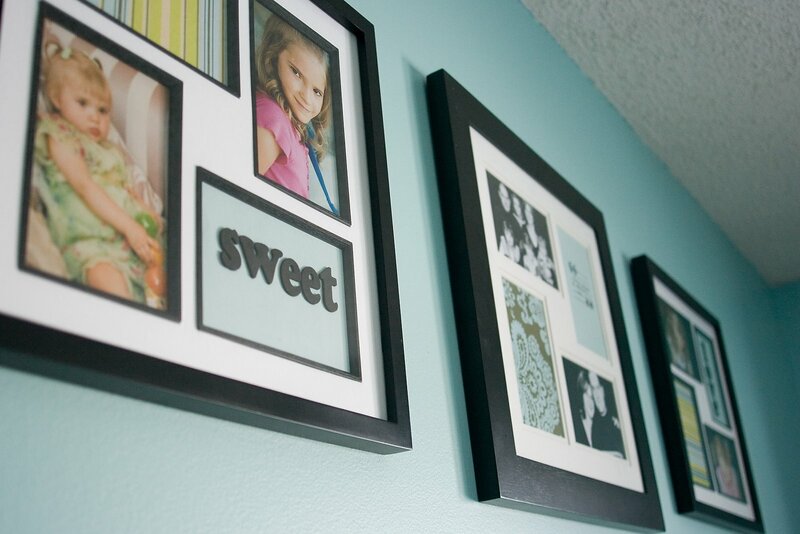 Above that are these awesome 13″ frames (wider with the frame part) that my hubby bought me at Wal-Mart. I altered them slightly and hung them on the wall to remind myself why I scrapbook in the first place. These photos make them look small, but they are nice and big and stretch across the wall. So nice. On the wall next to it I’ve got my little mesh shelves that hold baskets of my foam stamps, boxes of magazines, adhesive, scissors, punches etc. , and my drawers for my rubber stamps and other little embellishments. I love how neat this keeps everything. On the wall next to the door I’ve got this sweet little setup. I love having a handy place to keep my newest magazines and a place to display recent layouts for a while. I still keep my papers in legal sized hanging folders – so handy on a shelf next to my work space. I also keep extra boxes of embellishments etc. on a shelf beneath that. I’ve also got a large CD stand holding my tunes and my photos CDs close at hand. Eventually we’ll get a computer up there, but that won’t be right away. For now I just have to skip down to the office area to use the computer when I need it. I can suffer for a while! LOL! We haven’t got the sofa bed in yet, but when we do, I’ll take some photos of the other end of the room. The closet has a built in organizer and there is a fun little photo gallery thingy I’ve got next to the end table over there. I’m so excited to have a beautiful and bright room to create it. Now can you see why I had no problem doing 38 layouts in a couple of days? Who would want to leave??? LOVE this room! Especially the happy color on the wall. Fabulous! Beautiful Room Bobbi!!!! I wanna come over and scrap at your house…lol! Very cool! Did you paint or was that the original color! I love it! LOVE IT, LOVE IT, LOVE IT! !We are getting ready to finish the basement so I can get my area ready and this was like perfect timing for you to post!You rock!Robin G. BEEEEE-oooooo-teee-FUL!!! 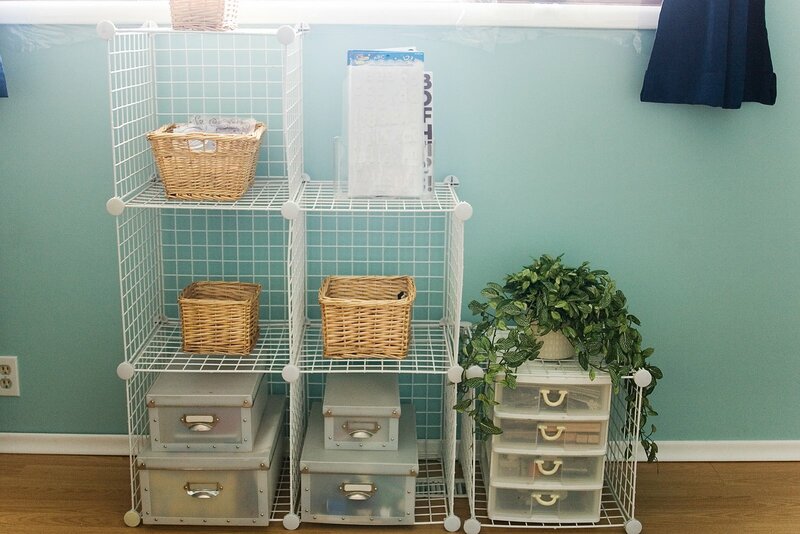 This girl who likes organization is drooling! LOL! I love it! I really love the colors!I’m jelous!!! I’m green… of envy that is! 🙂 I’ve dreamt of a craft/art room of my own for ages now. Hey, you need to check out the free PhotoScape program (if you can’t find it by googleing it, there’s a link in my blog for it). It does photo collages so fast! It has tons of different collage templates. Really simple and fast to use. It has other fun photo tricks as well. My husband saw me trying to do this kind of “copy and paste” collages and said wait a second and found me this program. It’s way easier than all that pasting etc. Love it you lucky girl. I hope you love this sanctuary you created. BTW- Tag. You’re it. 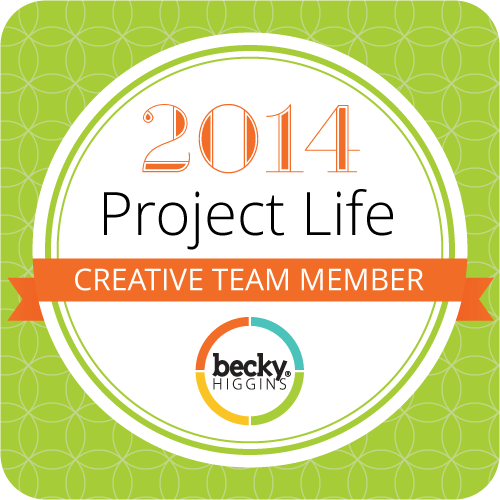 I’m new to the blogging thing, and don’t know too many who do blog, so I’m tagging some of my faves. No pressure! I love your room!! So fun!!! Love it, I love the color, just like Soft Sky! wow! 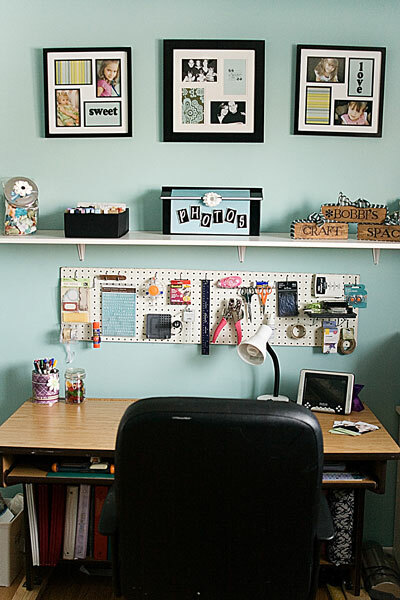 Love the peg board and those shelves with baskets and the magazine holders… ok.. I love everything.You’re my organizing hero. You are so LUCKY!!! That room is AMAZING!! I wish I had a room like that. I just have a cluttered desk in our office room. I guess I could de-clutter & clean it up to look nicer. I guess I need to do that. But wow! 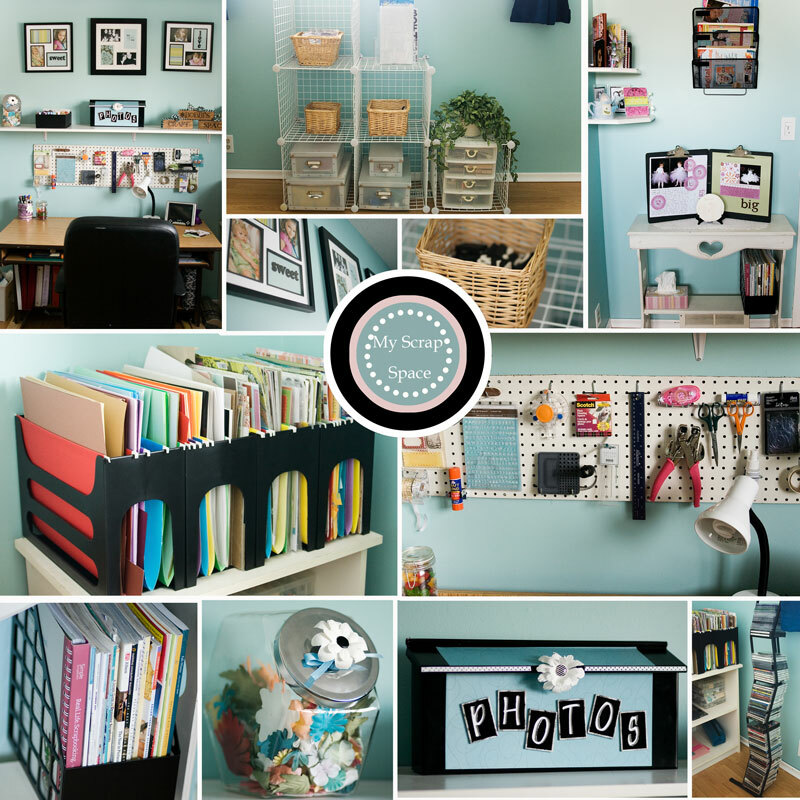 I love your craft room! !